Our history began as a joint venture with the Lutheran Congregation in February 1779. A joint lot and adjoining graveyard were purchased in March 1786. The log building originally intended for a tavern was named “Old Dutch Church” and had the first pipe organ in the community. The congregation worshipped on alternate Sundays until 1832 when the building became unsafe. The Lutherans withdrew and from 1833 – 1844 the Reformers joined with the Presbyterians for worship. In 1843, the Reformers bought a lot on East Burke Street and a church was built and dedicated on May 31, 1846. To meet growing needs, a larger church was built and dedicated on September 22, 1901. Renovations of the interior have been done on several occasions, but the exterior remains the same†. The most recent renovation was done around 1950-1960 replacing pews along with eliminating two aisles in favor of one central aisle. The life within this church is as sustainable as the church’s original bell. The first bell was small, made of cast iron and hung in a tower erected at the gable end of the church. It was the first bell ever in the town of Martinsburg. The bell was replaced about 1804-1808 by a larger one. It was made of bell metal, tuned to the key of “G”, cast in Philadelphia, weighed about 313 pounds at a cost of $181.89. It was initially suspended in a crook of a tree, then later in a tower erected beside the church, because it was too large and heavy for the old cupola. Then around 1820, a third bell was put in use until the abandonment of the old church in 1832. 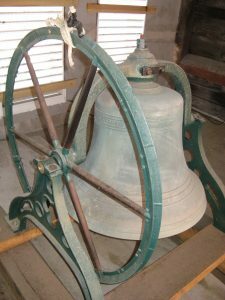 At first, the bell was owned by the Lutheran and Reformed congregations, but then the Reformed people bought the Lutheran’s interest for $40 and placed the bell in the cupola of the church until it cracked and was re-casted. Our present bell contains metal from that third bell, and today is iconic in that it symbolizes how persevering the church has been over time and yet, remains fundamentally a friendly church in a friendly community. During the latter 20th Century, the Christ Reformed Church-UCC, Martinsburg, WV was fully-fledged under the leadership of its present minister, Pastor Tom Hartshorn, since 1991. It is credited in the 21st Century as having wholeheartedly advanced its mission of being “…the worship of the Tribune God, the preaching of the Gospel of Jesus Christ, and the practice of loving service to all peoples, the furtherance of Christian Unity, and the promotion of fellowship among the membership and the community.” When you walk through its doors today, you sense a presence of “God is Still Speaking.” Members are chatting with each other, actively greeting others with a warm friendly smile, and sincerely striving for unconditional love. Where is the Christ Reformed Church of Martinsburg, WV in the 21st Century? Perhaps, it is best told during one of Pastor Tom’s sermons titled, “Savior, Like a Shepherd Lead Us.” In his own silent, unpretentious way Pastor Tom takes scripture and often with a mystical sense of all knowingly delivers the word of God relevant to today’s world events. The sermon is delivered as if he tapped into the special need or the thoughts of someone in the pews, maybe even the collective conscious of the church family. Like other sermons, he typically asks members of the congregation to think for themselves as he is only to provoke thinking! He encourages everyone to seek out what is reasonable to them. He shepherds their thoughts by genuinely asking, “Where do we find Jesus today! How might we begin to identify Christ events? He proposes finding Christ events through ‘experiences” both in and outside church…events that happen to all individually or as a society. He concludes with explaining a Christ event is when something happens where you no longer think or act the same before the event! To experience the Reformed Church of Christ UCC of Martinsburg, WV today is to look for the “reflection of Christ’s open, embracing, nurturing, and eternally relevant” in its members! All are welcome to attend church service on Sunday morning and experience the Jesus events of this magnificently beautiful church and church family! This historical presentation is accredited to Ms. Dolores Cook Brown (1937-2017), author of the book “The History of Our Church – The Christ Reformed Church, Martinsburg, WV” published in 2008. A full historical chronical is detailed in the book.